3) Math skills are improved in people who knit/crochet. Following patterns is all about the math...and it has a subconscious benefit to the brain! 4) The yarn arts help to calm anxiety. 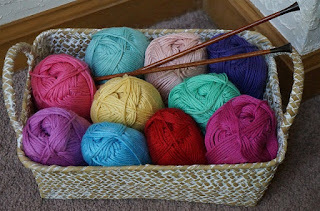 Sitting with yarn and hook or needles is meditative! 5) Crochet and knitting sharpen memory. Your brain must rely on memory to create the different stitches in your work, where to change colors, etc. The more you knit or crochet, the stronger your memory becomes! 6) Crochet/knit can help manage pain. These crafts require focus, and when you're focusing on your work, you're NOT focusing on the mental or physical discomforts associated with chronic pain. Knitting or crochet are great distraction techniques! 7) Knit and crochet help to quell mindless eating. Busy hands and a busy mind don't have time to think about overeating! 8) Knit and crochet help improve brain health. Studies have shown that crocheters and knitters in the 79-89 age group have the healthiest brains and memories. 10) Knit and crochet help boost one's confidence and self-esteem. There's nothing like completing a project and knowing that you can hold it up with pride and say, "I made this!!!"